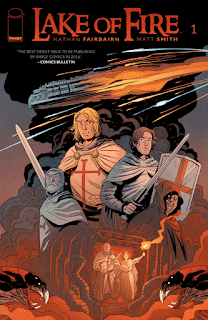 The Fellowship was fortunate enough to obtain a copy of LAKE OF FIRE #1 from Image Comics. Nathan Fairbairn writes, colors and letters, and Matt Smith draws. It’s the year 1220, and Theo is a newly minted knight of the cross, traveling to his first military action. The noble in charge really just wants him out of the way, so he sends Theo and a group of other potential troublemakers off to a town leagues away. But unbeknownst to the noble, there really is something going on in that distant town – something that will take more than a little faith to overcome. How would the Dark Ages handle an alien invasion? If it’s any consolation to Theo, no one else has any idea what to do in this situation either, not even the drunkard veteran knight. You’d think that this story would have to go in a horror-like direction, but maybe not, given how the characters work together. And the critters themselves are pretty creepy, with some interesting coloring choices and just horrible appearances. One thing we can be sure of – there will be a great deal of questioning of faith before this story is over. How well these men of God can handle the reality before them will make for a cool story. So go check this one out. LAKE OF FIRE #1 is available now at your FLCS or at imagecomics.com.